Otorohanga farmer Allan Harnett with his modernised 1946 McCormick International Farmall. Most tinker with old tractors to restore them – but not Otorohanga farmer Allan Harnett. He’s just finished totally transforming and modernising an old 1946 McCormick International Farmall. The project is a special tribute to his late father Keith, who bought the tractor new and used it during the 1950s to break in his land at Rangiatea 15km east of Otorohanga. 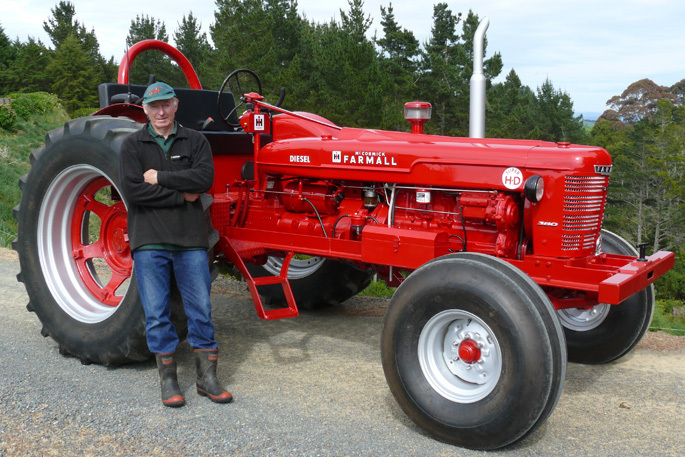 Today Allan lives on the same property but has given the Farmall a modern facelift – to honour his father. “My father Keith would have put up with a lot with this Farmall in the early days. It had a steel seat, it didn’t have much power – only 25hp – and the steering was pretty hard. “It was pretty rough to ride with the steel wheels bouncing all over the place,” says Allan. Allan says Keith used the Farmall as his main tractor until buying a Fergy 35 and then a 135 “and the Farmall sort of become stuck in the back of the shed”. Then Allan’s father-in-law Harcourt Rawlings got him interested in vintage tractors, so he bought a Ford County 945 and did that up. In 2011 he started work on the Farmall – now 6.5 years later he’s finished, after working on it “on and off”. Improvements include swapping the old steel seat for a comfortable modern upholstered wide seat that can fit up to three adults. “Now the grandkids can come for a ride on it, there are 10 of them,” says Allan, who has also used tractor to deliver his daughter Alaine to her wedding. “I’ve also repowered it with a Ford truck motor so it has a 120hp now – instead of 25hp. The bonnet and steel frame have been lengthened. I’ve put a heavy-duty drawbar on, added hydrostatic powersteering, put a wide front axle on and I’ve changed the steel wheels to rubber – it’s even got a radio,” says Allan. Allan did all of the welding and painting work himself – but got help for the upholstery, reconditioning the motor, and the electrical work. Coy about revealing the project’s cost, fearing his wife may see this newspaper article, Allan says it’s been a “labour of love”. Allan, who belongs to the Otorohanga Vintage Machinery Club, is now looking forward to taking the Farmall on tractor treks and club events. “It’s retired from farm work now.” Good work Allan! Does your farm or your boss have a pet tractor? Or maybe a pet digger or bulldozer? If so, we’d love to hear about it! Email: merle@sunmedia.co.nz with a photo of it and a contact name and phone number. We might even throw a prize your way for a good yarn.